Technology and politics. In the past, the two appeared distinct: the former evoked images of wires, electricity, and computer chips while the latter conjured up stately government buildings, wooden podiums, indecipherably long legislation, and partisan stalemates. In the 21st century, however, the intersection between them elicits buzz and contention. During the millennium technology signified benevolent modernity, now it evokes disruption and division. When the Internet first took off, the hope was that it would make the world more interconnected, democratic, and egalitarian. Silicon Valley was long perceived as a home of those “cutting-edge nerds toiling for the good of humanity” and paving the path to the future. As the Arab Spring, the Maidan protests, or the Umbrella Movement demonstrated, social media has arguably facilitated significant political mobilization. Moreover, the tech industry has joined the activist fray as its members denounce Trump’s repeal of DACA, anti-net neutrality stance, and withdrawal from the Paris accords. Despite the benevolent portrait that tech entrepreneurs (or their communications specialists) have so brilliantly commissioned of themselves, sentiment towards the tech bubble has transformed in the last twelve months. Fears abound that the technology industry will disrupt traditional labor sectors and dis-employ millions of Americans. Be it allegations that Russia conducted a digital disinformation campaign to disrupt the election, claims that social media cultivates echo chambers that exacerbate disastrous civic division, or calls for Silicon Valley’s biggest companies to be dissolved under antitrust laws, public opinion of tech has soured. It is now evident that Silicon Valley is the new powerbroker in Washington: America’s five largest tech companies out-lobby Wall Street two-to-one and use soft power to influence society in the form of think tank and trade association funding. The United States lies at an awkward crossroads as we attempt to grapple with an industry that is not as benign as we had imagined: How should we address a sector that has precipitated both astronomical economic growth and intense public outcry? These nuanced questions are ones we must contemplate. On Tuesday, January 31st, the inaugural Cardinal Conversation between Stanford alumni Peter Thiel and Reid Hoffman will discuss this issue of our time. Peter Thiel graduated from Stanford University with a B.A. in Philosophy and a J.D. from Stanford Law School. While at the Farm, Thiel “started a campus newspaper to challenge the prevailing orthodoxies” (that would be us) and served on the ASSU. Since his teenage years, he has remained committed to a faith of “authentic human freedom as a precondition for the highest good.” Having launched technology companies PayPal and Palantir, and venture capital firm Founders Fund, Thiel’s place in Silicon Valley’s Hall of Fame is secure. His notoriety stems from his intuitive sense of innovation: “he has made his fortune by recognizing the potential of… idea(s) long before his peers.” Indeed, he was the first in the valley to place bets on Trump’s victory; his contemporaries thought him crazy for it. In addition to his remarkable success in the tech industry, Thiel is a public intellectual whose ideas are consistently novel. In his defining essay “The Education of a Libertarian,” Thiel dreamt of three technological frontiers that would create new freedom: cyberspace, outer space, and seasteading. Nevertheless, Thiel believes that science is “technology’s older brother who has fallen on hard times” and worries that Silicon Valley’s thinking is not “big enough to take our civilization to the next level.” As an expert on the technology sector, a libertarian role model, and true contrarian, Thiel’s stances on technology and politics are sure to be thought-provoking and unorthodox. Reid Hoffman earned a B.S. in Symbolic Systems at Stanford and a Masters in Philosophy as a Marshall Scholar at Oxford. While at Stanford, he served as an ultra-liberal member of the ASSU, alongside Thiel, and developed a desire to shape the world on a “large scale.” Like his impending conversation partner, Hoffman is entrenched in Silicon Valley: he was an executive at PayPal, founded LinkedIn, and is now a partner at Greylock Capital. Where he diverges from Thiel is not in CV or alma mater, but in his politics. Hoffman likes to say that “with power comes great responsibility” and has, much to his chagrin, been dubbed the Koch brother of the left. Thiel describes “Reid as left of center, with a very strong sense of empathy for those who are less fortunate.” Hoffman “tend(s) to believe that most Silicon Valley people are very much long-term optimists.” He seems to be. 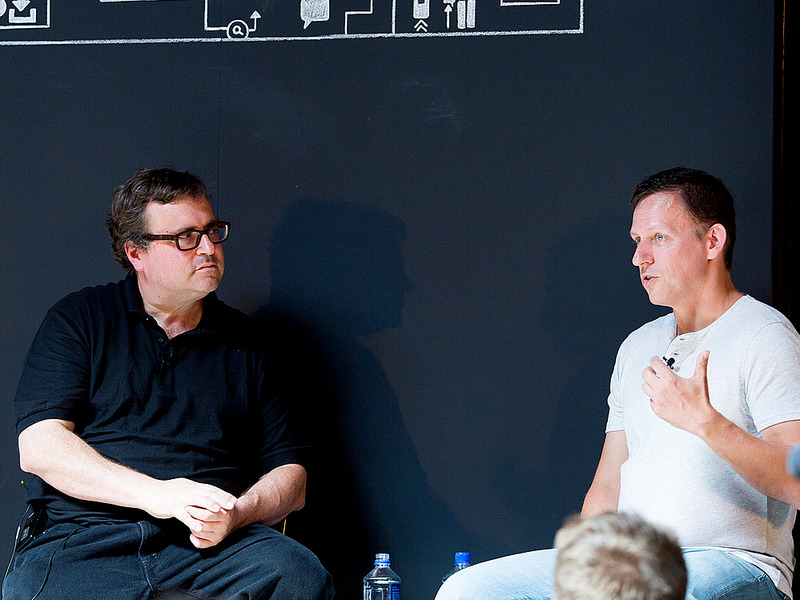 Both Thiel and Hoffman concede the incredible power of technology to reorient and reshape society. While neither is trained as a technologist, both are brilliant, contemplative, public figures. Where the former imagines technology unlocking thresholds of freedom, the latter ponders its disruptive force. As Opinion pieces and Stanford courses endeavor to unravel the ever complex intertwinement between Silicon Valley and government, who better to hear from than two men who are veterans of the technology industry and new found participants in the political universe? As citizens searching for civic engagement and students longing for academic fulfillment, we ought to carefully reflect upon these experts’ ideas. While Congress’s aisles may be discernibly divided into blue and red, the intersection between technology and politics is not. The inaugural Cardinal Conversation will take place on Wednesday, January 31, 2018 at Hoover’s Hauck Auditorium between Reid Hoffman and Peter Thiel. Visit the Facebook event and website for more.